Which Back Issues are Getting the Avengers: Infinity War Effect? Okay, so Avengers: Infinity War has hit. And the speculator market has gone mad. Are there any back issues in your collection that might be worth finding to sell for lots of money? Very possibly yes. 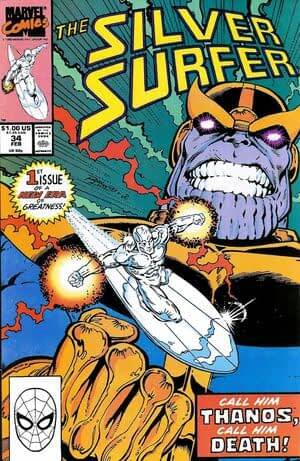 The story being tackled by Avengers: Infinity War is based on a comic book storyline that began in Silver Surfer #34 by Jim Starlin and Ron Lim back in 1990 and usually sells now from $10 to $20. #35 is more like $20 as it brings back Drax and subsequent issues are around $5. Thanos Quest span off as a two-issue series from 1990, Thanos searching for the Infinity Gems, with issue 1 selling on eBay for $36 and #2 selling for a higher $45. Infinity Gauntlet from 1991 should be the real no-brainer. First appearance of the gauntlet, first Thanos with the gauntlet and the showstopper scene from the movie, issue 1 now sells for around $30. The set of all six has sold from $80 to $120 of late. Its sequel, Infinity War, named the movie — though the plot is closer to Gauntlet, but can be picked up for as little as $5. The set of issues 1-6 recently sold for $30. Another sequel, Infinity Crusade, can be picked up for a lot less, around a buck each, though a set of six sold for $25. You should be able to find cheaper. And the ongoing series that spun out of these, Adam Warlock and the Infinity Watch is a $2 book if you’re lucky. You might also consider the more recent Infinity Gauntlet mini-series from Secret Wars. Tangential but fun, issues 1 to 5 can be picked up for less than cover price. Infinity Free Comic Book Day 2013 marked the revival of Thanos at Marvel and has the first appearance of Corvus Glaive and so, while free, sells from $5 to $15. There are a lot of these out there of course. It was free. New Avengers Vol 3 #8 for the first appearance of The Black Order, Proxima Midnight, Ebony Maw, and Black Dwarf has sold for $30 of late but has gone higher. The more recent Thanos series has picked up a lot of heat and attention. Thanos #1 has sold for $27 and Thanos #13 has rocketed to $80 for Donny Cates and Geoff Shaw‘s first issue and the first appearance of Cosmic Ghost Rider, #14, at $37, #15 at $50 for the Ghost Rider reveal. 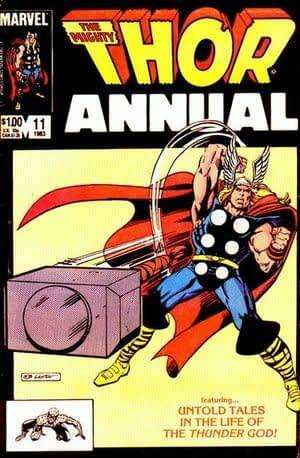 But the big unappreciated one is probably Thor Annual #11 from 1983, which has the first appearance of Eitri. His appearance in the movie is rather different, but it may well be striking enough to push this comic up the charts. Copies have been selling from $15 to $40 in the last couple of days, but you can still pick up copies on eBay for as little at $7. And you are looking for the first appearance of Stormbringer, that would be Thor #339. Recently selling for $10, you should be able to find it for less.